Gallery hours: Wednesday to Saturday 10 - 5. Sunday 2 - 5pm. Mondays and Tuesdays by appointment. The gallery is located on the corner of John Street and Stirling Highway. Parking is available on John Street and behind thegallery - except during openings. This is a special 'poems from poetry editors' issue, entitled 'Editorial Intervention'. It's good to see what 'they' write themselves, right? Go to http://www.cordite.org.au/index_22.html and enjoy. back on it's pouring down steadily now. 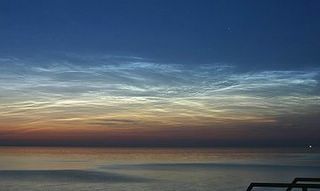 An 8-minute movie of the display shows how the clouds ripple and move like waves in the ocean. Noctilucent clouds (NLCs) are a mystery. They hover near the edge of space, far above ordinary clouds. Some researchers believe they're seeded by space dust. Others say they're a sign of global warming. Whatever they are, they're beautiful, and northern summer is the best time to spot them. 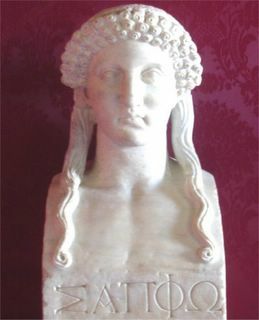 Sappho, dead 2,600 years, is still coming up with new work. 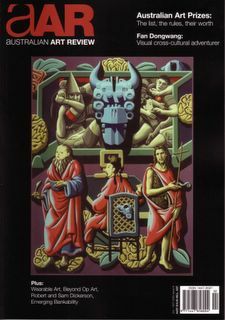 Hamilton Stone Review, Issue 6, Summer 2005, Now Online! Featuring fiction by Pat MacEnulty, Ramsey Wilkens, and Masha Zager and poetry by Gene Frumkin, Amy King, Kenneth Pobo, Joseph Somoza, David Hopes, Stephen Vincent, Bob Marcacci, Harriet Zinnes, Kerry O'Keefe, Gregory Vincent St. Thomasino, Eileen Tabios, Frederick Pollack, and David Howard. At this time, the Hamilton Stone Review is not open to unsolicited fiction submissions, but will be taking unsolicited poetry submissions until Sept. 15, 2005, for Issue #7, which will be out in October 2005. 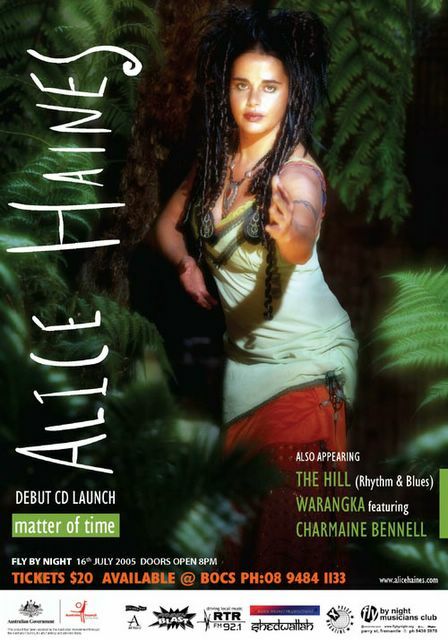 Well, if you can't read the detail on the Alice Haines poster following, the debut CD launch is at the Fly By Night Club on 16 July 2005 from 8 pm. $20 entry but there are other bands and a whole night's entertainment, so don't hold back! 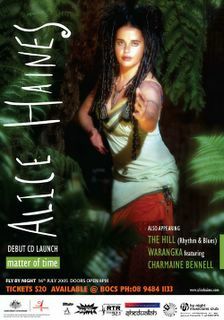 Alice Haines CD launch should be a blast. These are just some of the lyrics of 'Great Leap Forward' by Billly Bragg. He sang it on Andrew Denton's 'Enough Rope' on ABC TV some time back, but I have just now been reading the interview which concludes with these lyrics. The WRITE STUFF competition closes on 30 June. 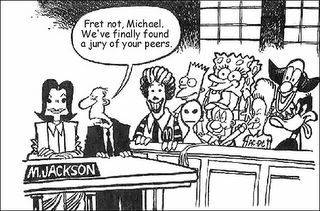 JUDGE: this year the poetry section is being judged by Stephen Edgar, who kindly agreed to be the judge long before he was announced as the winner of the inaugural Australian Book Review poetry prize. It is wonderful to have his support. The Write Stuff Poetry competition is now totally self-supporting, having started last year with some funding from a private poetry benefactor. The Write Stuff is a money-losing venture ... All funds raised by the comp. 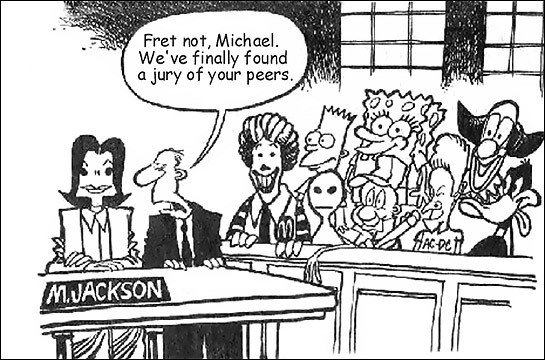 go into the next comp and paying the judge etc. With no-mind, the butterfly visits the blossoms. I do not "know" others, Others do not "know" me. Not-knowing each other we naturally follow the Way. Ryokan, Japanese poet. He lived as a Zen Buddhist monk in the Niigata area of Japan from the late 1700s through the early 1800s. This snippet from CipherJournal at http://www.cipherjournal.com Much interesting and good reading in translation and about translation. What Kind of World-view Do You Have? I'm a Postmodernist -surprise, surprise. if he was made by us?